After struggling with the traffic, I came late for this outdoor painting. It was my first time trying to paint at the duck pond in the city domain. The more I looked the more I was puzzled with the scene. Plucked up the courage I junped right in. After capturing a few ducks, ten in all. Pew!! It was not that hard! I must have the ducks implanted my head! 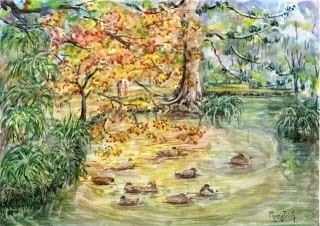 The autumn tree made me think of Monsier Monet with his lily pond. I had a feel of what the light in the pond did to his painting.